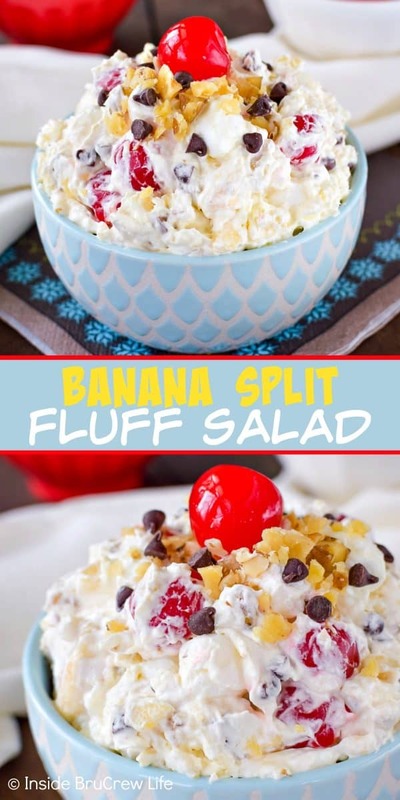 This Banana Split Fluff Salad is an easy ambrosia salad that is loaded with all your favorite banana split toppings. Stir everything into one bowl, and it is ready to go. Bring a bowl of the best fruit salad and a Banana Split Bundt Cake to your next picnic and watch everyone devour the sweet goodness. Now this is how I like to eat my salad. Anything loaded with fruit, nuts, marshmallows, and chocolate has to be a good thing. Yes, you read that right. This ambrosia salad recipe has chocolate in it. Oh, yeah! 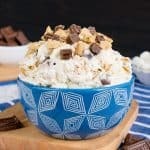 By the way, if you love chocolate, you definitely need to check out this Rocky Road Fluff Salad! It’s a dream dessert for chocolate lovers! Now I know what you are thinking. There is no way a bowl of creamy goodness should be called a salad because it does not have the normal and typical salad ingredients. Well, technically this is more like a dessert because it has pudding and marshmallows in it. But hey, I like to call it fruit salad because then I can eat a second helping without feeling too much guilt. 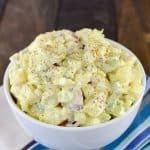 My mother-in-law makes a pistachio fluff salad that I absolutely love. You probably have had this same green fluff salad at church potlucks or barbecues because that’s always where I end up eating it too. Jello salad and ambrosia salad have been staple desserts over the years at the many church functions we have been to. This S’mores Cheesecake Fluff Salad always disappears in a hurry when we bring a big bowl of it to any event! The other day I was totally craving one of these easy fluff salads! But since this is me we are talking about, you know I got a wild and crazy idea to change it up some! 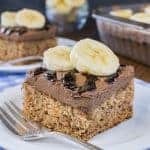 Ever since I made this Banana Split Brownie Pie, I am always looking for ways to turn things into banana split desserts because that’s a flavor I will never tire of! 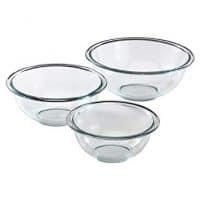 I started rummaging in one of my dessert cupboards trying to find some fun ingredients that needed used up. Banana pudding, walnuts, and marshmallows were all shoved in there together, so I pulled those out. As soon as I saw them, I headed over to cupboard number two for some chocolate chips, cherries, and crushed pineapple. 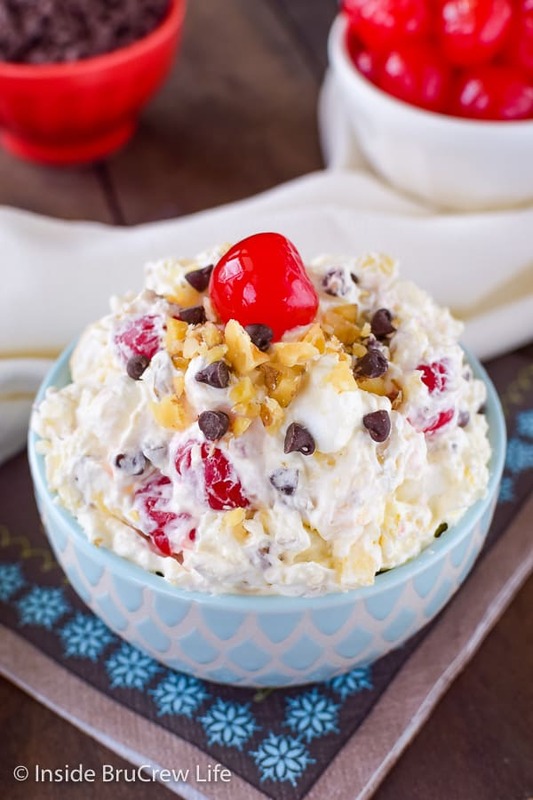 All the classic banana split flavors were about to happen in this easy ambrosia salad. We won’t talk about how many cupboards my baking stuff has taken over because I’m ignoring that fact right now. Lucky for me, the bananas on our counter were still bright yellow, so I grabbed a few of those to include in the fluff salad. We go through so many bananas in our house, so it varies what color the bananas are going to be. Ripe bananas meant this banana split fluff could happen right away. Some days those bananas are green, some days yellow, and then some days the brown ones sit there until I the urge to make a batch of these yummy Double Chocolate Banana Muffins. Stir the pudding into the pineapple in a large mixing bowl. Do not drain the can of pineapple because the juice will help the pudding thicken up. Fold in an entire container of Cool Whip with a spatula. Yes, I said Cool Whip. By now, you know I’m partial to that white stuff. We all like to eat it by the spoonfuls. Try a frozen scoop with peanut butter because it’s an amazing combo. 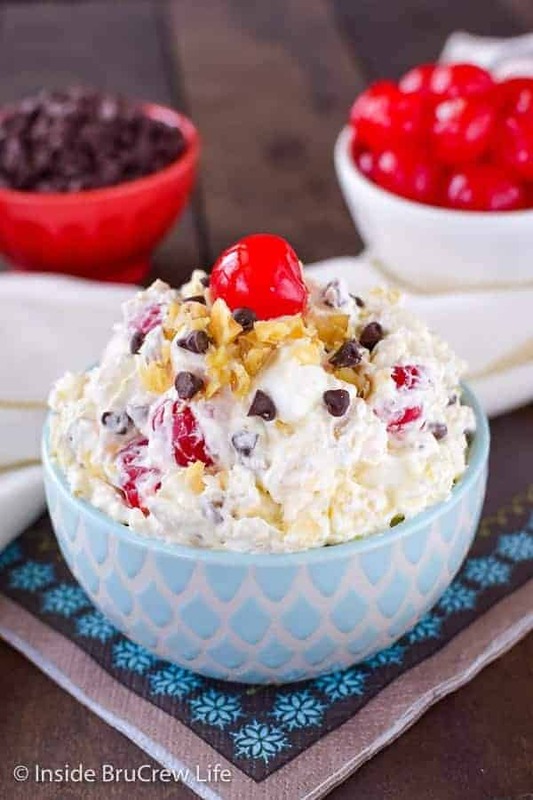 Gently stir in marshmallows, chopped walnuts, banana slices, mini chocolate chips, and maraschino cherries. Feel free to change up the banana split toppings to include the ones you like or don’t like. Refrigerate the dessert salad for at least an hour because the flavors need time to thicken and meld together. Plus, this gives the marshmallows time to soften and become soft fluffy bites in your mouth. 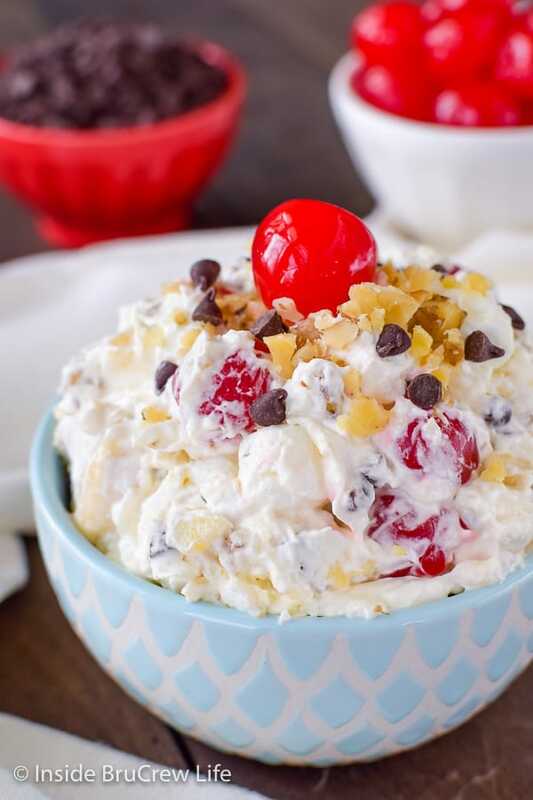 If you are serving this banana split dessert salad later in the day or even the next day, I would recommend stirring in the bananas right before serving it. This just keeps the bananas from getting all brown and mushy. Creamy pudding, crunchy nuts & chocolate chips, and juicy fruit all in one bowl! 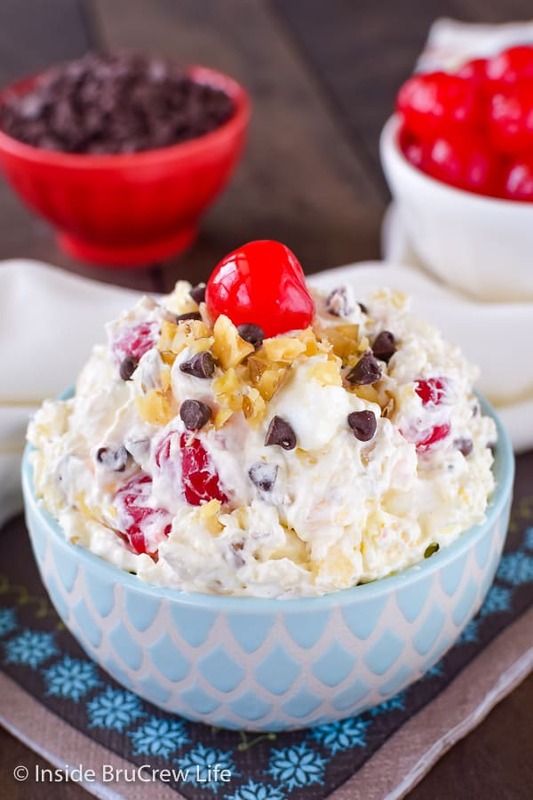 Dang it, now I’m craving another bowl of this Banana Split Fluff Salad! Time to whip up another one very soon. These easy No Bake White Chocolate Cheesecake Parfaits have layers of cookies and fruit in each cup. Easy little treat to bring to parties! 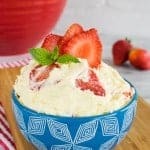 This Strawberry Shortcake Fluff Salad is a fun and pretty dessert for spring and summer parties or picnics! I love anything s’mores so this S’mores Eclair Cake is calling my name. Easy Tiramisu is a fancy no bake dessert that will disappear in a hurry. Layers of creamy cheesecake and coffee soaked cookies will have everyone going back for more. This No Bake Cherry Swiss Rolls Cake is so fun and easy to put together using snack cakes and cherry cheesecake. 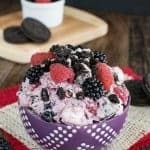 This Banana Split Fluff Salad is an easy fruit salad loaded with all your favorite banana split toppings. Stir everything into one bowl, and it's ready to go. Stir together the dry pudding mix and pineapple until dissolved and thickened. Fold in the Cool Whip with a spatula. Gently stir in the marshmallows, nuts, chocolate chips, bananas, and cherries. Refrigerate at least 1 hour to chill. Makes about 8 cups salad. *If you are making this fluff salad to serve later, stir the bananas in right before serving to keep them from getting brown and mushy. **You can also dip the banana slices in lemon juice to keep them from browning too quickly, but it may add a slight lemon flavor to the dessert. I plan to make your Banana Split Cheesecake for the Holiday. Wow! I haven’t ever had something like this before. We go through a ton of bananas too. I buy them two bunches at a time these days! It would be perfect for potlucks! I knew you would like this “salad”. I have never even heard of a fluff salad and now I’m craving one lol! Second helpings? Yes please! Also, I hear you on the cabinet space lol 🙂 Love this recipe girl! Oh, girl! You need a fluff salad like now!!! I hope your family enjoys this fun salad! I totally want to face plant this right now! Love the banana split twist – so fun! Yes, face planting is allowed in this yummy salad!!! Yep, my kinda salad! Pinning this, though I can’t decide what board to pin it to? Salad? Side dish? Dessert? Fitness? um…. Hahaha! Pin it to all the boards 😉 Thanks for sharing!!! Fitness….Imma fitness whole salad in my mouth, lol ! Yes! Thank you! This is the exact perfect way to make a salad. No rabbit food for me, thanks. Of course, things like this are probably the reason my waistline is as it is but… oh well! Thank you for sharing! I will definitely be saving this for later! Do you drain the pineapple? Or is the liquid needed to mix with the dry pudding powder? No, you do not want to drain the pineapple. The liquid helps dissolve the pudding mix! I hope you enjoy it! I’m with you! This is my kind of salad! Pinned! I would love for you to share at this weeks Happiness Is Homemade Link Party! Happy Easter! 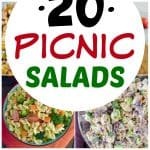 Yes, this is the perfect spring and summer “salad” for all dinners and picnics!!! What a fun twist on the traditional treat! I love this!! Do you have a recipe for the pistachio fluff and/or the cherry fluff often found in grocery store deli’s and buffets? I don’t have a recipe for either of those. I’m sorry! Do you have a different option for the pineapples? I love banana splits, but I usually substitute the pineapples, as I don’t like them. I would just leave out the pineapple and mix it with the cherries juice and all. I want to try this for a summer family reunion but I think I will mix all then freeze in a 9×13 pan that way it stays cold what do you think? I have never frozen this dessert. I’m not sure how the fruit would hold up in the freezer…I have a feeling the bananas would turn brown and gross. Hi, Brenda. You did it right 🙂 The dry pudding mix gets added to the pineapple. The liquid from the can of fruit dissolves the pudding mix. I hope your family enjoys it!!! This looks insanely delicious! I love fluff salad as it is and happen to be making a fruit one but man, I wish I was making this! Next time this is a must! I just made the Banana Split Fluff Salad for a salad luncheon today. The bowl was wiped clean! Had several people ask for the recipe. My family was disappointed I didn’t bring home any leftovers for them. Will have to try this … love anything with bananas. Do you serve this as a dessert, or with dinner?? Seeing the chocolate chips, I’m guessing it’s more of a dessert. Do the bananas not get brown? We ate it as a dessert. The bananas will start to get brown after a day or two…if you have any left. You can dip them in lemon juice before stirring them in if you like. This dessert is yummy. I an just wondering if there is any way to keep the bananas from turning brown? I am making this tomorrow. To keep the bananas from turning brown, I’m going to mix them in the pineapple juice, then remove the fruit and add the pudding mix then follow the rest of the steps. I just made this for the first time and for some reason it is very runny and not setting up. I followed the recipe to a T. Do you have any suggestions on what to do next time? You didn’t make the pudding before stirring it into the pineapple, did you? You want to stir the dry pudding mix into the pineapple. The juice from the crushed pineapple make the pudding. I have made this countless times and it has never been runny. 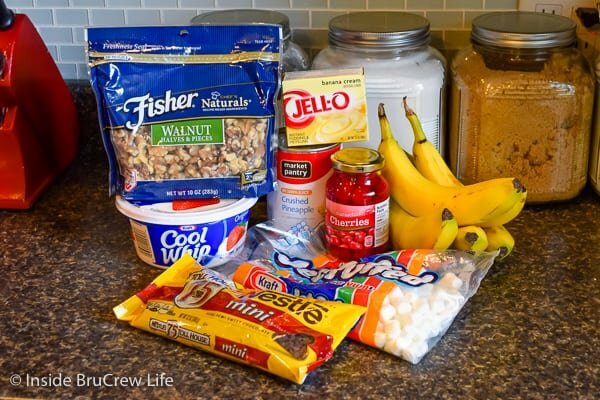 Can this be made the day before (minus the bananas) and kept refrigerated overnight? Can you use sugar free pudding or should it be regular pudding? I have never tried it with the sugar-free pudding. Everything else that you add to this fluff has plenty of sugar in it, so I would just use the regular. Thanks, if I decide to try the sugar free, (which I already bought) I’ll let you know if it works. You can also use sugar free cool whip with the sugar free pudding. I made this for Thanksgiving, and followed directions. The salad was runny and never really fluffy, soggy and flat. I don’t know what I did wrong. How much milk did you use? You cannot use the box directions or it will not turn out. The pudding and milk mixture should be extremely thick before you fold in the Cool Whip. I did not use any milk at all. I just mixed the pineapple and pudding mix together. I do think however, I did not wait for that mixture to thicken. How long should you wait before continuing with the rest of the recipe? Also found the mixture of items to be very sweet. Any suggestions if I try this again. Thank you. Oh, I’m sorry about that. I was thinking of my other fluff salad recipe. The pudding and pineapple should have been thick before folding in the Cool Whip. It is a very sweet mixture based on everything in it. Hello, I will make this for my friend daughter birthday party, but my question is; I do not prepare the pudding as it says in the box, but the pudding powder will thicken up with the pineapple juice? So as soon as the pudding is thicken, I could go ahead and fold the cool whip? right? Yes, that is exactly right. Dump the pineapple and juice into a bowl with the dry pudding mix. Stir it until it thickens and then fold the Cool Whip in. I hope you enjoy it! thank you for answering my question Jocelyn! we sure will! This stuff is ah-mazing!! My husband took a big bite and mid mouthful goes, “oh my god that’s good!” I don’t like the texture of bananas but like the flavor..so I didn’t add the slices but the pudding was banana-ey enough for me. Can’t wait to make more of your recipes. Yay! I am so glad you let me know how much your family enjoyed it! I hope you find more recipes to try! I am planning on making this for my upcoming baby shower for a different spin on the traditional pistachio fruit salad. I have a question tho, when looking at the recipe it says 1- 20 oz can of pinapple. I bought a huge 6 lb can at costco but it is only 10 oz surprisingly so I’m curious if I will need two of those cans or if it was a miss type or what lol please help me, thank you!! I would be surprised if the can from Costco that is 6 lbs. is only 10 oz…maybe it is a typo and it is really 100 oz.? You do need a 20 oz. can of crushed pineapple, but that can size is the same size as a can of pie filling from the store. I hope that helps and that everyone likes the salad at the shower. As much as i love your food ideas, your website is a nightmare to use. I get so effing many pop up ads i cant even navigate. It has taken me 20 minutes to get to find your actual RECIPE instead of the verbal talk about the recipe. I am beginning to understand that the longer i stay on your website and see the pop up ads the more cash you get. Your site is truly a nightmare to try to read and scroll with the continual pop ups. Please stop this nightmare ughhhhhh. I am so sorry you are having so much trouble. I did email my ad provider to see if they could look into the issue. Each ad does have an “x” to close them out. Yes, I do make money from people being on my site, but I’m not trying to keep you there to make all the money on you. I support my family by creating free recipes for people to make. Ads and sponsored work are one way I help pay our family bills. It should not take you 20 minutes to scroll past the story and pictures that I share though. I hate pages like this wanted the recipe,not scroll past everything else,then never find the recipe. I am so sorry you feel that way. You must not have scrolled far enough. The recipe card is below the last picture. It even has a printable link, so you can print it! Please don’t crucify me , I was wondering if there was something I could substitute for the banana I would like to make these to put in shooter glasses for a wedding however I don’t want Brown bananas Is there something else that could be used I know it wouldn’t be called the banana split…lol… it just looks so good!! My mom made a fruit salad similar to this every holiday, and we have continued this tradition! Instead of chocolate chips, we use chopped dates, and diced apples. We don’t use pudding and in place of cool whip we use whipped heavy cream with a little sugar to sweeten it, YUMMY! Your mom’s fruit salad sounds delicious too!! I love the date and apple combo!!! Just made it and it is a hit with my teenager. Way to go! How far in advance can you make this yummy looking fluff? You can make it a day or two ahead of time, but I would stir the bananas in right before serving so they don’t turn brown. I hope you enjoy the “salad”. Do you use the juice from the cherries in the salad? No, you want to drain the cherries. I like to pat them dry with paper towels before cutting them up. I hope you enjoy the “salad”! So lovely. So nice. Very informative. God bless you. If I cut this recipe in half (there is only me to eat it) would I only use half the pudding mix? Yes, I would measure the pudding mix and only use half of it. I hope you enjoy it as much as we did. This salad was really amazing! My kids loved it! I love to serve this as dessert during family barbecues! How fun! My girls are going to love this! This looks incredible! Can’t wait to make it for a BBQ we’re going to next week!